Florida State University sophomore Sarah Warren is already making a name for herself on campus with her unique research. Initially, Warren didn’t know much about Florida State, except that it was a top-ranked university that was home to a renowned research program and a winning football team. Once she did a tour of campus, Warren knew she wanted to be a Seminole. The native of Orlando, Florida, is double majoring in political science and English literature. She took no time getting involved on campus by taking advantage of every opportunity, digging into the depths of her studies and becoming captivated with research. English and political science may seem like two very different fields, but Warren has found interesting correlations between them during her research. That same year, she completed her thesis on selective incorporation and federalism, “Over-Due Process: Federalism, Selective Incorporation and the Warren Court.” She presented it at the Florida Undergraduate Research Conference and the 17th Annual Undergraduate Research Symposium at FSU. Currently, Warren is working on a project with criminology professor Daniel Maier-Katkin and history professor Nathan Stoltzfus analyzing the autobiographies and testimonials of female members of the National Socialist German Workers’ Party. Warren’s innovative research ideas and creativity have made her a skilled leader in her field at a young age. She believes that it’s important for all students, regardless of their major, to get involved in research. Since freshman year of high school, Warren has valued giving back to the community. She volunteers as a teaching assistant at the Russell Home for atypical children in Orlando, Florida, and at the Liberty Counsel, an international nonprofit legal organization. Warren believes that availing herself to as many opportunities as possible is the best way to positively impact the FSU community. Since arriving at FSU, she has put this mentality into play by getting involved with a number of organizations on campus. She is the marketing coordinator of the FSU Swing Dance Club and a foreign policy contributor for the Millennial Review. 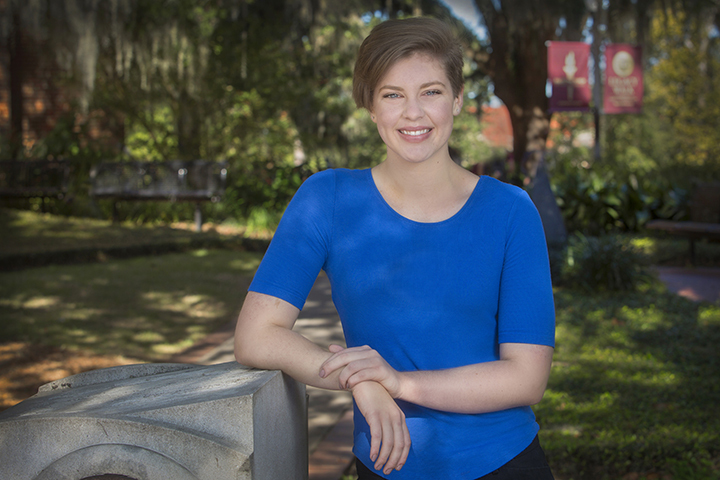 She is a member of the FSU Honors Program, where she helped create the Honors Lending Library, which facilitates a community atmosphere within the FSU Honors Program and hosts events for students. Warren also is a Garnet & Gold Key recipient and has made the President’s list. Over the next two years, Warren plans to keep expanding her impact on campus and continue her research. After graduation, Warren hopes to pursue a law degree at the FSU College of Law, specializing in criminal and contract law.